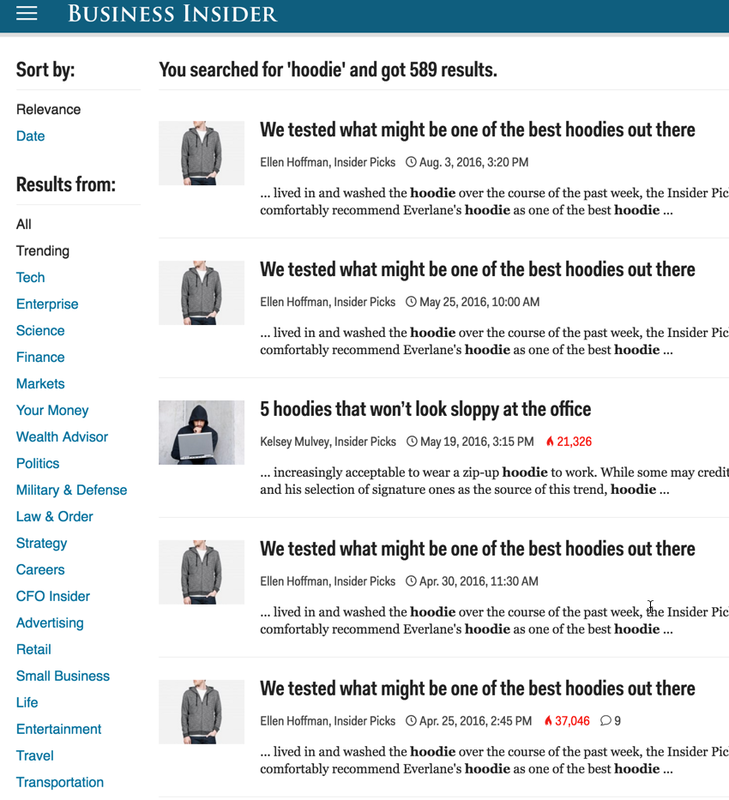 Mistake number 1: I visited the website of American Giant, a maker of apparently-popular hard-to-get-but-not-really hoodies. You might know them from their frequent appearances on BusinessInsider.com, and in little text+image ads on other news websites. Frequent readers here will know that I typically block ads (paying via app.optimal.com in order to feel okay about doing so) but every now and again I need to test things and so I let down the shields. I ask brands on Twitter how to opt-out of seeing their retargeting ads every now and then (they usually have no idea, or give terrible advice), and at least once every 6 months or so I’ll also go through the opt-out procedures with one of the big opt-out service providers who tick the “self-regulation checkbox” for behavioral targeting companies to do what they like with your data. I saw one of American Giant’s ads, clicked on the top corner to see that it was being served by AdRoll, a retargeting company, and that I could click to opt-out of being targeted by them with a couple of clicks to Ghostery’s opt-out service. This morning, I was greeted by the following screen. When I returned in the afternoon, however, it seemed to function. 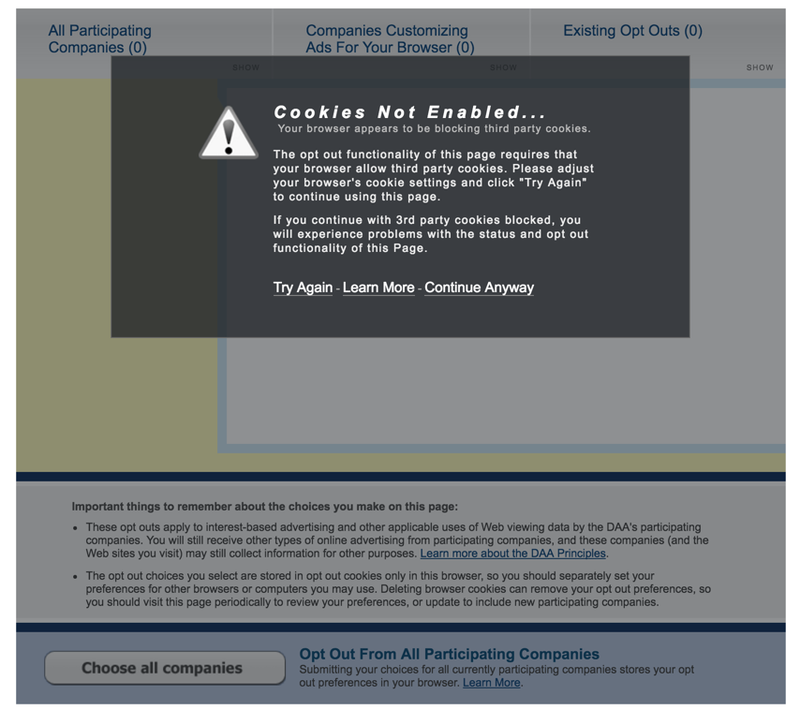 Were I an average consumer, and I’d actually managed to get to this page in the first place, this would probably put me off, since it was inaccurate regarding my cookies. Here’s the full list in a Google Doc broken down by ones that you have to visit the site versus not. Here’s a screenshot of the interface. AdRoll was one of the 342 that required me to visit the website to opt-out. I’ve heard of them and they’re generally thought of as a good company, but there are hundreds of names on this list even people who’ve worked in this industry for years have never heard of (and affiliations with industry organizations usually require a membership fee only, not any degree of vetting). It seems like a lot of clicks to opt-out of things; and by the way, if you for some reason delete your cookies, IRONICALLY you’ll have to go through this entire rigamarole once more since opting-out from being targeted based on your cookie data, requires cookie data. It does NOT mean the company will no longer track you (remember, your cookies are still getting touched, unique user identifiers are still being exchanged), they just will “no longer use your data” (so they say — but I’ve seen at least one example of a large company having a broken opt-out mechanism that persisted for weeks and only got fixed after I told them about it). And yes, the complete lack of standards as to how many ads could or should be jammed into your browser will persist -- publishers are free to choose any number, are bound by no standards or controls on the number of behavioral targeting pixels that may hitch a ride with these ads on their pages, and publishers are not counting up the bytes of your mobile data plan being used for these things either. 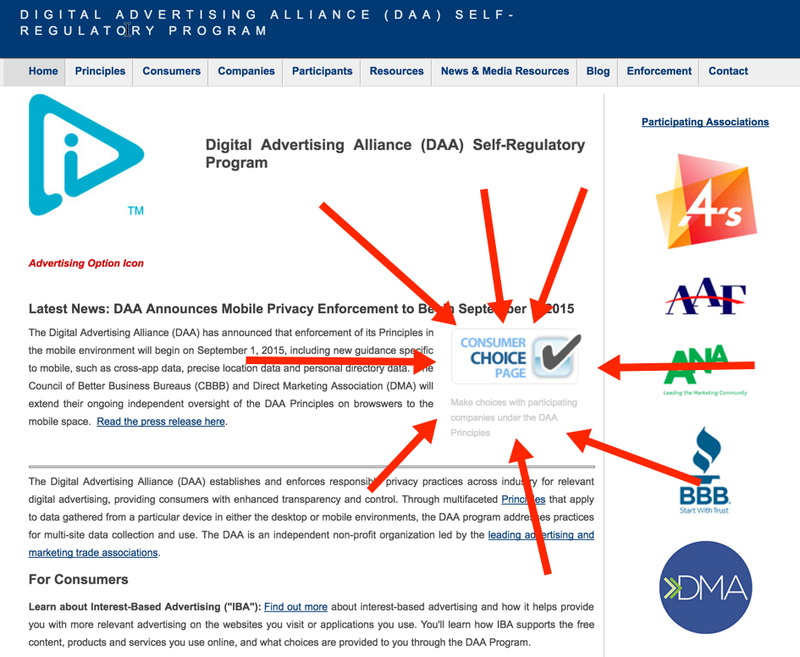 So I guess you’ll just keep seeing (an indeterminate number of) ads and being tracked. By over 600 companies you’ve mostly never heard of.